Pipelines – the visual representation of a developer’s workflow – are one of the core features that make Buddy easy to use and configure. However, some of the developers prefer the classic way of managing configuration using YAML files. This is why we’ve decided to add support for YAML files as an alternative way of configuring pipelines. The option is available in the right column of the Pipelines tab. IMPORTANT: Upon switching to the YAML mode any existing pipeline in the project will be removed. You can reproduce the pipelines by copying the configuration from YAML box and pushing it to the repository as buddy.yml. Please mind that the feature is still in beta and requires some polish, so any feedback is highly appreciated. 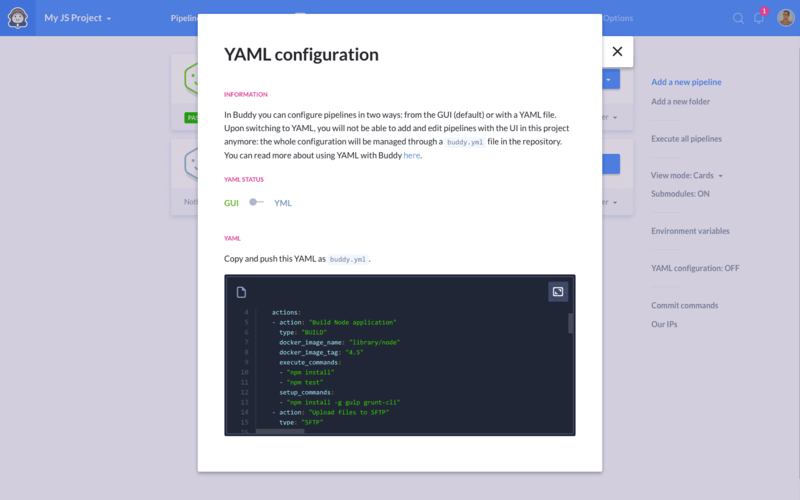 The complete documentation on how to use YAML in Buddy is available here.